There are hundreds of thousands of us, all around the world, getting ready for spring marathon season. Here in the running highlands of Kenya, I’m lucky enough to be training with some of the best marathoners on the planet. We are getting ready for London, Boston, Paris, Ottawa, and many other marathons, and I want to share how we do it so no matter where you are, you can train to run like a Kenyan. To start off, there are three phases of training for a marathon. Go out on easy and moderate runs without caring much about speed. There are no hard speed or hill work sessions yet. This phase can vary in length, but should be at least 3 months. Athletes are now getting quite fit and can get into intensive tempo runs and speed workouts. This phase lasts about 2 months. When you start to reduce their training a bit in order to preserve enough energy for the race. Typically the last 2 weeks before the race. A training calendar might look something like this. Let’s take a detailed look at what you’re doing during each stage. At this stage, what matters is getting as much mileage as possible into your body without rushing your training. You want to build your overall fitness and get your legs and feet used to many hours of use. You can start this phase easy running 3–4 times per-week, but want to build to the point of running 5–6 days per-week. You want to be at the point where you’re comfortably running 1hr 10 minutes to 1hr 20 minutes each weekday morning and adding a 2 hour easy run every weekend. The key words here are comfortable and easy, you should finish each run feeling like you’ve still got plenty of energy. As time goes, you can slowly start adding one speed session or one hill workout session per week, but making sure they are not intense. About 10 weeks out from your race, it’s time to start the harder workouts. You don’t want to start this period of more intense training too far out from your race because it takes a toll on your body and you become more susceptible to injuries, illness, or exhaustion. It doesn’t matter so much which group one joins for training in Kenya because the programs here are similar. Even the days for particular kind of training program are almost the same everywhere. Mondays are hill runs; Tuesdays are for track intervals; Thursdays are for speed workouts on the road, be it fartleks or measured distances; Saturdays are for long runs and Sundays are for resting. Some runners can rearrange their workouts, like moving the long runs from Saturdays to Thursdays and doing their speed workouts on Saturdays. It’s also important to allow some flexibility to allow for a mock race, fun run, or respond to how your body is feeling. Before every workout session, athletes need to warm up for 20 to 30 minutes of slow running or calisthenics. Every day of a hard workout in the morning is followed by an easy 40–50 minute run in the evening. 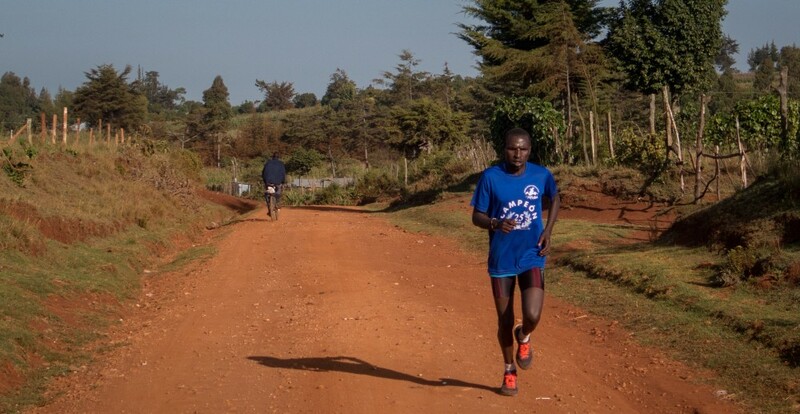 In most of the training groups in Kenya, hill work is usually the first workout of the week. But no matter when you do it, it’s very important to do at least one each week to build strength and stamina. Depending on how close athletes are to doing their races, there are different ways of doing hill workouts. Most athletes will start to incorporate hill runs during the loading stage. Hill workouts during loading stage will not be about the number of repetitions, but just the overall amount of time running up and down the hills — typically around 1 hour. With time, as you get closer to peaking, hill workouts start to incorporate timed sprints on shorter measured distances on a hill. These can be 400m, 200m or 100m sprints up the hill, repeating 10–20 times depending on the length of the sprint. This is the hardest workout of the week, as the trick to attaining great speed for marathon actually seem to lie in great track interval workouts. Most athletes call these intervals “lapping” because they are mostly 1600m, 2,000m and 3,000m hard repetitions around the 400m track, with a cool-down period between sets. The pace is typically brutally fast, much faster than marathon race pace. The total distance done in one session is normally between 12km to 20km. At the end of these “lapping” sessions, athletes do a few shorter 200m to 400m sprints before cooling down. There’s no better workout for helping build power and speed. You should feel like you’re flying when “on” during speed work. In contrast, recovery pace should feel gentle. Fartlek is one of the most common speed workouts done by long distance athletes in Kenya. It is a great workout since it doesn’t need any measured portion of the road or a flat surface. The most common such workouts are 1 minute fast, 1 minute slow runs or 2 minutes fast and 1 minute slow repetitions. The total length of the run will normally be 40 to 50 minutes. Tempo runs are runs that mimic a race day. You want a good course for this run. There is usually a favourite route at every training spot in Kenya, and every one or two weeks athletes will try to run fast and set a new course record on the route. You want to be running at a hard pace for around 1 hour, so most courses in Kenya are 16km to 18km. But tempo runs are really about time and how long you want to run at this gruelling pace, so sometimes athletes decide to warm up for 20 minutes then run a hard 40 minutes. At the end of this run you should feel tired, like you’ve just run a race. Alternatively, athletes can look out for a flat and straight 1km or 2km section on the road where they can do the intervals. You run faster than race pace, rest for a couple of minutes and then repeat. In most of the training camps in Kenya, a long run is done once every other week and a semi-long run is done in between. Long runs are usually distances between 35km to 43km while the semi-long runs are usually 25km to 30km. Water is crucial during long runs. If you’re consuming 300–600ml (10–20 oz) every hour, you’ll need more water than you can carry with you. Running groups here will have a vehicle drive along the course distributing water as athletes need it. Knowing that water is just right there when they need it and that there is a vehicle to hop into when the going gets tough, athletes are encouraged to give it their best efforts while training and also to run longer than they would have done without a vehicle by their side. Other days in between the tough workout days are usually 1hr easy runs in the morning and 40 to 50 minute easy runs in the evening. Often this will be Wednesday after the hard track session on Tuesday. On easy days you want to do plenty of running, but at a pace that feels like you could keep going forever. This is the last stage of training, and is all about letting the body recover from the hardest training so you feel fresh on race day. Tapering starts two or three weeks to a marathon and typically means a 50% reduction in time spent running each week from the peak of training. There will be no more runs beyond 25km and the speed workouts can remain intense, but will take relatively shorter duration and fewer repetitions. You should feel like you could keep running even after a track session. However, different strategies work for different athletes at this point. There are those who feel that when they slow down their training, they won’t be able to be fast on race day and prefer not to interrupt their training at all until race day. You just never know until you do a couple of races and know what type of taper works best for you. So listen to your body and aim to feel fresh on race day morning and strong all the way through the end! To get the best running shoes for your training, these made in Kenya running shoes — Enda Iten will make you enjoy your runs even more.